Following in the footsteps of some of Nintendo's more recent Kirby games such as Epic Yarn, Yoshi's Crafted World has Ninty's other big eater enter environments that look like they've been taken directly from the craft table of a (particularly talented) child. String, tape, newspaper clippings and paper clips are among the repertoire of the game's level designers and it all adds up to a series of stages that are wonderfully creative, with the designers constantly reaching for new and different ways to use the aesthetic to create new features. As ever, Yoshi leaps and gobbles his way though a 2.5D, side scrolling environment. He retains his handy ability to eat various items and enemies than spit them out to powerful effect. The game is carved up into 20 different worlds, each with their own stages and each with their own novel new elements for you to work with. You might have to pilot a giant paper-crafted Yoshi over obstacles or place a series of magnets to get at hard to reach places, for example. Then there's a particularly imaginative use of the craft element of the game that has them playable in reverse. You can play the traditional front side of the environment, then literally flip it to play the reverse side, complete with its own set of challenges. 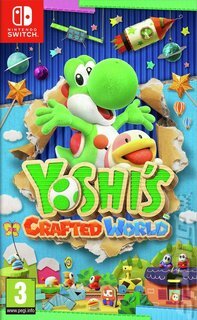 Yoshi's Crafted World is a fascinating twist on the platforming genre that aims to delight at every turn.